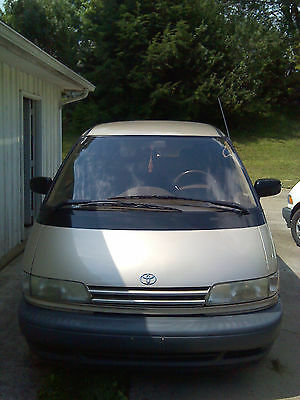 1991 TOYOTA PREVIA LE ... 225,567 Original Miles !!! This Car Qualifies for up to 550$ cash back !!! (Call us before You Bid, and We will tell you how you can get up to 550$ off from the price of the car). 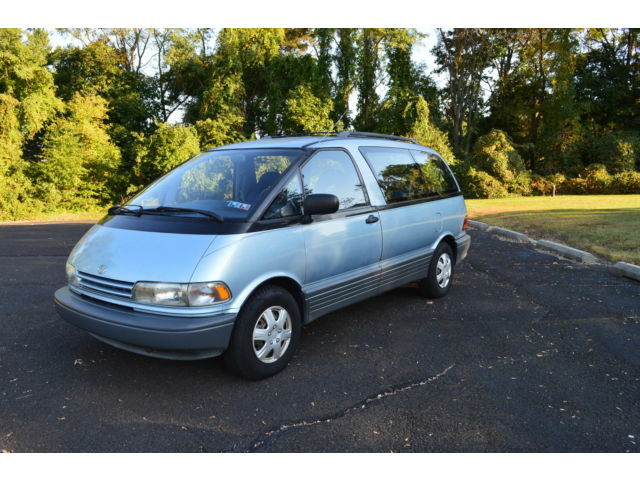 Call us or Email us with any questions 732-582-9038 ... info@ROVERCLASSIC.COM 1991 TOYOTA PREVIA LE ... 225,567 Original Miles Vin : JT3AC12R6M0001306 Engine : 4 Cyl, 2.4L Transmission : Auto Exterior : Blue Interior : Blue Body Style : Van This beauty comes to us from California, it has Automatic Transmission, Power Brakes, Power windows, Power door locks, Power mirror, USB / MP3 / AM / FM and Rear / Front Air Conditioning. The paint looks original with no rust on the car. Full service was performed on this beauty. Oils, filters,struts and shocks were replaced. Tune up performed as well as new tires installed. 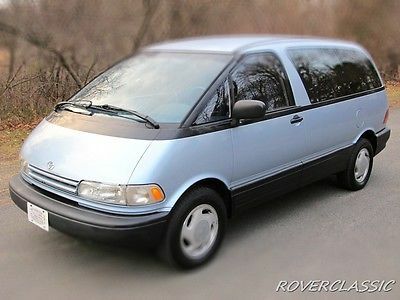 For a complete CARFAX REPORT see link bellow ---Carfax--- http://www.roverclassicpictures.com/listing_pictures/1991-TOYOTA-PREVIA-LE-JT3AC12R6M0001306/carfax.pdf We have taken many pictures of this vehicle, and we know that it can be a pain to click each one of them separately, so we have created a web page that contains a slide show. 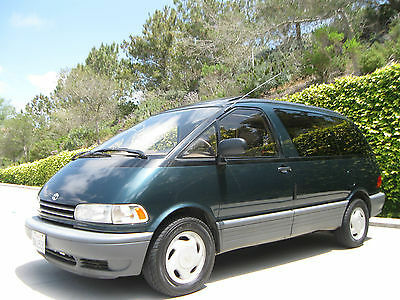 You are welcome to click the link bellow to be taken to the slide show page or You are welcome to scroll down this page to view each picture separately ---Slideshow--- http://www.roverclassicpictures.com/listing_pictures/1991-TOYOTA-PREVIA-LE-JT3AC12R6M0001306/gallery.php We offer our customers LOW COST DELIVERY Please see the map for the approximate delivery charge, Please contact us for the exact delivery charge. Delivery is not done by us, it is done by Fully insured Trucking companies that we subcontract to deliver our cars. Click on the map for approximate delivery rate http://www.roverclassicpictures.com/listing_pictures/Stuff_for_Ebay/2.jpg Please be aware that we charge $149.00 Documentation Fee. This fee will be added to final cost to cover our expense for paperwork and mailing. Please email us or Call us with any questions prior to bidding We are also open to BUYitNOW offers 1-732-582-9038 Alex SOME OF THE CARS THAT WERE SOLD BY US If you have any questions please email us or call us prior to placing Your bid 1-732-582-9038 Alex TERMS OF SALE 1. 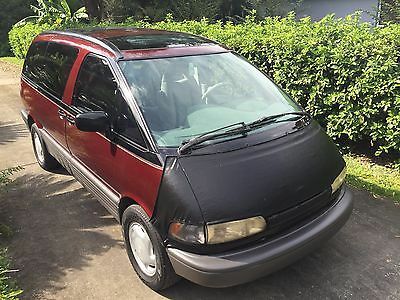 Placing a Bid: By bidding on or buying this vehicle you are entering into a legally binding contract to purchase this vehicle and you agree to abide by all terms of sale set forth herein.2. Vehicle Representation: Although we describe all our vehicles to the best of our abilities, it is still possible that we may have unintentionally made an error or left some information out. Please keep in mind that used vehicles may have typical dings and scratches inherent for their year and mileage. Interior wear should also be considered depending on the vehicle’s year and mileage. Opinions and expectations can vary, so please contact us if you have any questions or concerns regarding the condition of this vehicle. Used cars may not come with all of the original books, keys or accessories. Please review all photos carefully and if there is anything you are not sure about, ask questions prior to bidding. We are not responsible for errors or omissions in our listings. The mileage may be different than advertised due to test drives and demos. 3. Vehicle Inspection: We welcome and encourage potential buyers to inspect the vehicle but such inspections must be conducted prior to completion of this auction or deposit submission. This vehicle is available for inspection at any reasonable time. If you choose to have the inspection done by a licensed professional, you must do so at your own expense and at our location. It is the responsibility of the buyer to have thoroughly inspected the vehicle, and to have satisfied himself or herself as to the condition and value based solely upon that judgment. Furthermore, it will be assumed that you have inspected this vehicle fully if you have placed the bid or sent in your deposit. Some cars that we have on our site are not owned by us, they are listed on our site by their owners. We rely on the owner for the description information, reports as well as pictures. It will be assumed that buyer have inspected the vehicle, paper work as well as reports fully and will not hold us responsible after the bid was placed or deposit sent in.4. Financing: If you are planning to finance this vehicle through a lending institution, you must secure the loan prior to bidding. Secure all finances and be able to follow through with the payment before you bid. Please do not call us for financing help, we do not provide financing.5.Warranty: Unless stated otherwise, this vehicle is being sold “as is”, "where is" and with all faults and possible defects. No representations or warranties are made by seller, either express or implied, including but not limited to warranties of title or implied warranties of merchant ability or fitness for a particular purpose. Nor are any representations or warranties relied upon by bidders in making bids. We are not the first owners of this vehicle and therefore cannot guarantee history, condition, reliability, past repairs, rust issues / repairs, mileage, title, salvage / history of salvage, function or performance of the vehicle. You are only buying what we have. Manufacturer’s warranties may still apply. You may choose to purchase extended warranty from any aftermarket warranty company that can be found online.6. Vehicle Transportation: Buyer is responsible for shipping and/or pickup of the vehicle. All shipping charges are the buyer’s responsibility. We will not be responsible in any way for claims arising from shipping damage. Shipping companies have insurance policies that protect buyers against damage. If you choose to pick up the vehicle yourself, you would have to take care of your own temporary plates. We do not provide any, nor do we help you in obtaining them. We do not meet customers at our local airport; closest airport to us is Newark, NJ.7. Payment Information: If you are the winning bidder/buyer, you must contact us within 24 hours of winning the auction or getting invoice to set up payment arrangements. We do add 149 document fee to every car we sell. We require a 500 dollars non-refundable deposit within twenty-four (24) hours. This deposit can be made through PayPal to fellyNY at gmail.com (Paypal deposit is used to place a hold on the car, it will be refunded back to PayPal, ones the car is Paid in full. Usually this is done within 1-2 days after the car is paid in full). In the alternative, you can make your deposit Cash in person or Bank wire transfer. If the deposit is not received within the required time frame and alternative arrangements were not made, we reserve the right to make the vehicle available for sale to another buyer. The remaining balance is due within 5 calendar days of making the deposit. We reserve the right to keep your deposit and resell the vehicle to another buyer if final payment is not received within 5 calendar days. As final payment for the vehicle, we will accept a certified bank check, bank loan check, wire transfer, or cash. We will not release the vehicle and/or title until funds clear. If you pay cash, you can pick up the vehicle immediately. If you pay by wire transfer the vehicle will be available for pickup once funds are available in our account. If you pay by bank check, you will have to wait nine (9) business days until the funds clear.8. Title Information: Vehicle titles may be held by banks or lenders as collateral for loans. In some cases there is a delay in receiving the original paper Title after the vehicle is paid off. While we usually have all titles in our possession at the time of sale, there are occasions where we may have to wait for them to arrive. It may take anywhere from 3 to 7 business days for us to receive the title.9. Bidder’s Age: You must be 18 years of age or older to bid/purchase.10. Storage Terms: Once the auction/sale completed, we will store the vehicle free of charge for six (6) calendar days and at 20 dollars per day after that until the payment is made in full. Ones the payment has been made, the vehicle will be stored free of charge for ten (10) calendar days and at 20 dollars per day after that.11. Choice of Law & Forum: Buyer agrees that in the event any dispute shall arise, it will be governed by and construed in accordance with the laws of the State of New York and litigated in Richmond County. By bidding on this auction/sale buyer consents to service by certified mail.12. Miscellaneous: We reserve the right to obtain and verify the registered information of all users who bid on this auction/sale. In order to protect the integrity of this auction/deal, buyers with zero or negative feedback must contact us prior to bidding. We reserve the right to cancel any and all bids at our discretion and end the auction early in the event the vehicle is sold locally prior to the end of the auction, we shall not be held liable for such cancellations.13. Not responsible for Typographical errors, if you are not sure about something just ask us. 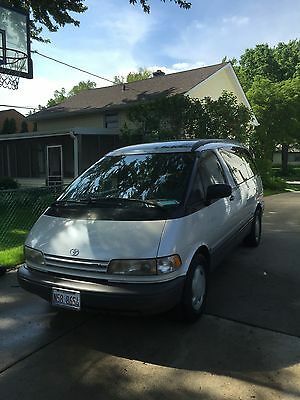 This is my daily driver 1992 Toyota Previa with over 331,000 miles as of this posting which will go up as I continue to drive "Blue" on a daily basis. I'm getting about 22 miles per gallon with Blue, maybe a little more on the highway. Power locks, windows, mirrors, cruise control all work as they should. JVC Detachable Face CD Stereo with Remote Control Seating for 7-8 (Interior is very nice for it's age. Non smoker owned vehicle) I bought brand new tires for Blue back in 2013 right before heading to South Dakota. Yes, in the past few years, I've driven Blue to South Dakota, Georgia and Florida without a single problem. I bought Blue back in 2011 with 316,000 miles from a Toyota Mechanic who, between the years 2009 and 2010 replaced the following parts: 1. Radiator and hoses 2. Water Pump 3. Front Suspension Parts 4. Timing Belt & Pulleys 5. Brakes & Rotors 6. I believe also the fuel pump, not 100% sure about this, but I do seem to recall him saying that too. There were several more things that I no longer remember, but I bought Blue in the first place because of all the work that had been done to him in the 2 years prior. This van always starts up on the first try, even after sitting for a week or 2. 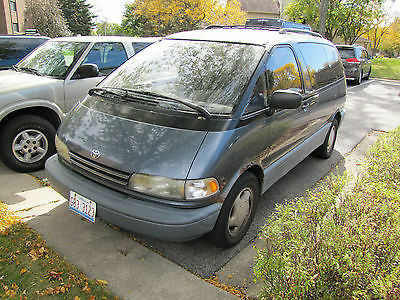 It has all the usual rust areas that you would expect from a Previa minivan living in the Chicago area. Some of the issues that you may or may not want to do something about: 1. The driver's side rear view mirror is loose and can be secured with a couple of screws 2. The exhaust pipe needs to be welded. It's loud, but not that loud and I've been driving it like this since 2013 and have never been pulled over for a loud muffler. 3. The heater and a/c work, but the fan switch is disconnected from the lever, so you CAN'T turn on the blower motor, but that can be fixed by any do-it-yourselfer with a little time and patience. The heat still flows through the system when the van is moving, so it does DEFROST the window and heat up the van nicely. 4. The rear door only opens from the inside. 5. The passenger and sliding door locks are not working with the key, but they can be unlocked from the inside, and they both open fine. 6. The driver's side door is impacting the front quarter panel, so I just go in through the passenger door after unlocking it from the driver's side. This can be fixed if you have the know how. 7. The power steering belt snapped a few weeks ago and now it has manual steering. 8. Rust 9. No front grill 10. Missing the front cover for the ceiling air handler. 11. Needs new wiper blades front and back 12. Make sure you warm up Blue properly before driving away, because he's a little temper-mental before his morning cup of coffee. Again, Blue always starts right up for me and has never left me stranded. That's what love will do for you and Blue. :) Overall, for the price, not a bad deal. You should be able to get several more years of reliable service out of Blue. The tires alone cost $400 2 years ago and have less than 3,000 miles on them. Thanks for looking. :) PS I will have pictures of the van uploaded this evening. 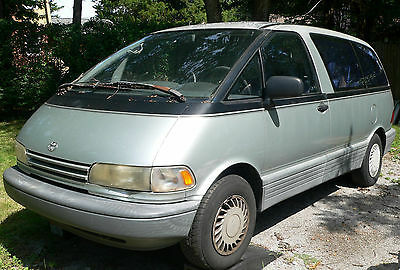 The current picture of the van was taken when I first bought it and there is rust around the wheel wells now. The tires you see in the picture are also for sale ($450). They are off my 2013 Jeep Wrangler and were used for less than 2 months. Less than 2,000 miles on the entire package. 5X127 bolt pattern, 225/75R16 Goodyear Wrangler ST tires. Condition: Engine smokes/steams: bad head gasket or cracked block. Will start, and drives OK. Body in good shape with very little rust. Drive train, tires, suspension, breaks, and electrical system all good. History: Third owner of this canadian vehicle, which is now unregistered (for salvage). Shipping and payment: vehicle in Burlington VT. should be towed (though likely can be started and driven short distances). 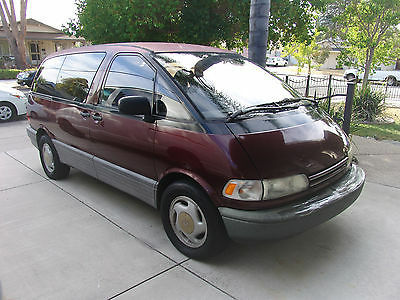 1996 Toyota Previa for sale only 112k. New complete brake, new shocks, new S/C OIL, NEW INTERIOR DETAIL SUPER CLEAN. A/C work great, but loose all refrigerant over last summer. Tires need replace before hit the snow and ice. I just put 1k miles in over a year, so I let it go for low start bid. Good luck bidding. 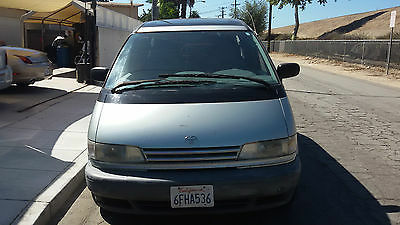 Not running, for parts or repair, 1992 Toyota Previa that the Harmonic Balancer broke & it has been parked since Nov. It deployed the driver's airbag. Before that, the AC & heat worked, it ran pretty well but loudly, passed Marta & was our dependable daily driver. Lots of wear to the seats. Non-smoking, clear title. It will need to be towed. 310,000 miles. 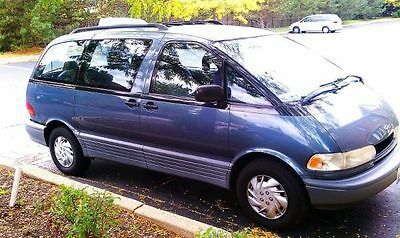 We are offering a spacious and reliable 7 passenger minivan for sale by owner. The transmission has been recently (2014) and fully overhauled. The car had some body damage. The accident involved minor damage that was easily repaired. When the accident occurred, the damage exceeded the car's value. We elected to repair the damage because it had been a reliable vehicle. We have the car since it was new. The title was transferred after a divorce in 2004. This is, in effect, a one owner car that has been well maintained. There is a factory tow hitch which has not been used since the year 2000. Many extra service parts are included and we would be happy to answer any questions concerning the car and its history..
Rare Find! 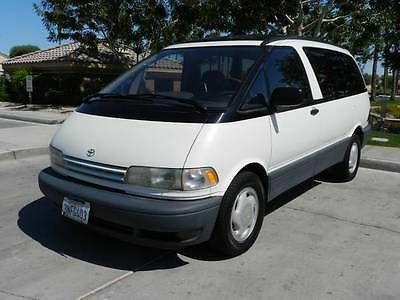 Just in is this clean, well maintained 1994 Toyota Previa LE minivan with 139,843 original miles in terrific condition throughout the entire vehicle. Carfax certified one owner from California . No evidence of cigarette smoke in the van. Runs and drives fabulous. Green in color with brown fabric interior. Bumpers are in great condition. Tires are radials showing % 70 treadlife remaining. Interior is clean and tidy. Fronts recline, middle row buckets recline and swivel, rear seats recline and fold up. Carpets are clean throughout with just some minor fade due to age. Door panels are clean. No broken trim or panels. Headliner is very clean. Van is equipped with rear air too. Powered by a perfect running 2.4L four cylinder engine, paired to a smooth shifting automatic overdrive transmission. The a/c blows cold. All mileage is true and correct and the title is clean.The body has small scratches and dents typical for 15-20 year old cars. Please feel free to email us at 3018425@gmail.com, stop by with any other questions or concerns. Thanks and we look forward to earning your business in the near future. Have a great day! Installed Options[PG] PRIVACY GLASS[CC] RECLINING CAPTAIN'S CHAIRS-inc: armrests, swivel feature, dual cup holders[DB] ROOF RACK (N/A w/SR Dual Moonroof) *PIO*Included Standard EquipmentInterior3rd-Row split folding rear bench seat w/headrestsCarpet in very good conditionCloth door trimCloth seat/door trimColor-keyed wraparound instrument panelCruise controlDeluxe ETR AM/FM stereo w/cassette/6-speakersDigital quartz clockDual air conditioningEntry/exit assist gripsFront/middle/rear dual cup holdersFull carpetingHD front heater w/rear seat heater ductsIlluminated passenger side vanity mirrorInterior in excellent conditionMiddle row 2-passenger bench seat w/adjustable headrestsPwr door locks w/anti-lockout featurePwr windows w/1-touch down featureRear window defoggerReclining front bucket seats w/4-way adjustable headrests/adjustable armrests & back pocketsRemote hood & fuel filler door releasesResettable tripmeterSeatbelt,airbag,low fuel level,low oil level & door ajar warning lightsSeats in excellent conditionSide front window demistersSoft urethane tilt steering wheelSpeedometer, fuel level, odometer, coolant temp gaugesExteriorAerodynamic halogen headlamps w/auto-off featureAnti-chip lower claddingCenter high-mount rear stop lampChrome front grille accentDual pwr outside mirrorsExterior in excellent conditionRear intermittent window wiper/washerSliding side doorTilt-out left side rear windowVariable intermittent windshield wipers w/wet arm washer systemSafety Features3-Point adjustable front seat belts w/adjustable shoulder belt anchors3-Point rear seatbelts in outboard positionsChild-protector door lockDriver & front passenger airbag supplemental restraint systemSide-door impact beamsMechanical19.8 Gallon fuel tank2.4L DOHC EFI 16 valve 4-cyl engine4-Link coil spring rear suspension4-Speed electronically controlled automatic OD transmission6JJ X 15" steel wheelsElectronic ignition systemEngine oil auto-feederFront/rear tubular double-acting shock absorbersFull size spare tireFull wheel coversMacPherson strut front suspension w/coil springs, front stabilizer barP215/65R15 BSW SBR all-season tiresPwr-assisted front/rear ventilated disc brakesPwr-assisted rack & pinion steeringRear wheel driveUnitized body/frame constructionAudioFactory brand stereo PLEASE READ AD IN FULL PRIOR TO BIDDING or OFFERS ! 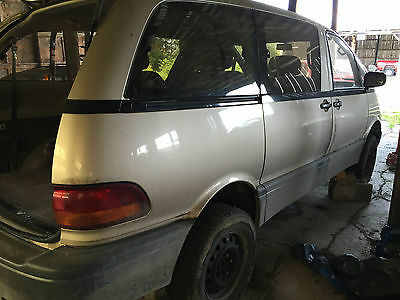 Our company recently began selling cars through Ebay. We sell cars older than 15-20 years we buy exclusively at various car auctions. As a rule these cars have had one or two owners and with original low mileage. But these cars can not have the status of new car so at any time anything can happen. You should understand that there is such thing as wear and fatigue of metal, plastic, rubber products. We also can not make them into new cars and give them a guarantee. We tried to indicate in the description of all the problems that have cars and are always ready for a dialogue with our customers. We have a lot of good feedback from our customers. TERMS of SALE:Please be advised that used vehicles will have typical scratches and dings inherent for their year and mechanical parts are subject to fail. We welcome a buyers inspection. If you plan to have a buyers inspection, please make sure you inspect the vehicle prior to the auction ending. Buyer is responsible for any inspection charges and fees. 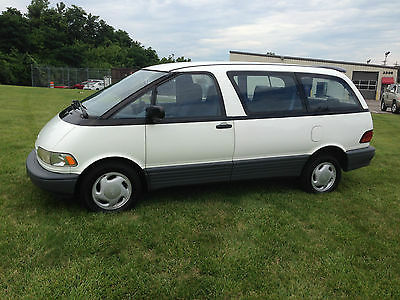 This vehicle is being sold "as is." No representations or warranties relied upon by bidders in making bids. Manufacturers warranties may still apply. Out of state buyers are responsible for all state, county, local SMOG city taxes and fees, as well as title service fees in the state that the vehicle will be registered. All taxes, fees and state inspections must be completed & paid in full in order for vehicle to be titled and registered. This takes place in your state and is your responsibility this is a Auction. All financial transactions must be completed within SEVEN days of auction ending. Please remember that I can't possibly write down every tiny detail about a vehicle .PAYMENT:A deposit is due 24 hours of auction completion. We accept PayPal for the deposit only. The balance is due within seven days. Pickup of the vehicle is within ten days of auction completion.The acceptable methods of payment are Bank Wire Transfer, Certified Bank Check (Cashier Check), Direct Deposit or Cash in person. We do not offer financing. Deposit down payments are nonrefundable. We do not accept trade ins. Any guarantee offer for this vehicle will be voided if payments are not made according to terms.WARRANTY: This vehicle will be sold AS-IS with no warranty expressed or implied by the seller. However, the buyer will be offered the option to purchase an additional Extended Service Warranty for all applicable vehicles.The title is guaranteed to be free and clear. There will be no liens or encumbrances on the title. The stated odometer reading is within +/- 500 miles.PICK-UP:Please check with us before scheduling your vehicle pickup. We are not a retail dealership, so it is very important to coordinate your arrival with us before finalizing your plans.We are approximately 20-minutes from San Diego International Airport (SAN) and the Greyhound San Diego Bus Station. We may be able to pick you up at any of these terminals, so please inquire if interested.SHIPPING:We have partner – shipping company “ Allstate Auto Movers “ . Additional shipping sources can be found on the Internet and you are welcome to choose any transport company of your preference.REGISTRATION, TITLES & FEES:Out of state purchasers do not pay any California sales tax. A $65 fee will be added to the final sale price of each online transaction, which will cover document fees and preparation, notarizations, and courier costs.Temporary Transit Tags are available through the state of Ca for $40, which will provide valid registration for a period of 30 days. In order to obtain this tag, please provide proof of insurance for any vehicle that you presently own.Titles are available to the buyer immediately upon full irrevocable payment, which is performed by bank wire transfer, cash in person, or certified personal check. Otherwise, the title will be sent to you after your payments have cleared our bank. Occasionally, a title is still being processed by the state and we will issue free temporary registration until the title is received. All vehicles we sell on eBay are stored in a separate secured facility and we require that all vehicles be picked up within ten days of auction completion. Storage charges after 20 days will be charged at $15/day for cars, and more for trucks and larger vehicles depending on size.We will try to exercise some flexibility to accommodate special requests regarding our terms, if they are placed before the auction ends. We also sell vehicles locally and reserve the right to cancel this auction at any time.MONEY BACK GUARANTEE:We Guarantee the Condition of our vehicles, and want you to be happy with your new purchase. We will gladly refund your money IF VEHICLE IS NOT AS DESCRIBED ON EBAY. Vehicle and title must be shipped back to us within 3-days of its arrival. It must not have more than 100 additional miles and must be in the same condition as stated on the original bill of lading from the transportation company. Buyer will receive full refund minus paperwork and prep fees, shipping charges and minus any damage incurred while in possession of the buyer or transportation company. We will not pay or reimburse any shipping. So Inspect Cause If returned your out shipping both ways.Please feel free to email us at 3018425@gmail.com or text (preferably) 619-600-69-61, stop by with any other questions or concerns.